Our latest monthly Moat Report Asia for October investigates an Asian-listed company who is the#1 healthy niche snack king in its domestic market with a market share of >73%. The company has spent over 30 years to build up an extensive wide-moat nationwide distribution network penetrating 200,000 Point-of-Sales (POS), including both modern trade (MT) (supermarkets,hypermarkets, convenience stores, gas stations, wholesales stores) and traditional trade (TT) (sundry stores, traditional shops). The company cultivates long-term customer relationships with its strong direct sales team of 200 professionals regularly visiting the stores with over 400 vehicles, comprising of trucks and the innovative mobile cash vans. We observed that super compounders Ecolab (ECL, MV $34.8bn) and Keyence (6861 JP, MV $26.7bn) have a strong solutions-sales specialist team and we think this Asian company has accumulated deep know-how infused in its direct salesforce team over the years to sustain resilient growth. The company distributes 5 product categories: (1) Snacks eg the Japanese snack brand Calbee; (2) Confectionery, (3) F&B, (4) Medicine, pastille, nutrition food, (5) Personal care and household products. 75% of its sales are domestic while the rest are exported, mainly to Japan (20% of sales). The company empowers its salesforce, particularly those traveling on mobile sales vans, with the utilization of modern technology in receiving orders, data verification, issuance of sales documents, delivery of goods. The company has created a sophisticated product storage and inventory management system and a delivery system that is flexible, convenient and fast. In terms of inventory management and working capital efficiency, the company performs far better with inventory period at 23 days (comparable peer 73 days) and cash conversion cycle (CCC) of 33 days (comparable peer 89 days). These long-term competitive advantages have translated to a superior ROE of 27.7% and sustainable cashflow generation. Even when compared to Asian MNC giants Universal Robina Corp (URC PM, MV $9bn) and Calbee(2229 JP, MV $4.3bn) who have scale advantages in cost efficiency and pricing power, the company has surprisingly better fundamental performance in ROE and profitability and is trading at a huge relative valuation discount at its current EV/EBIT 10.7x and EV/EBITDA 10.4x. Net cash at 9% of market value is a healthy reserve that can be productively allocated to capitalize on future growth opportunities without straining the balance sheet. Its attractive 5.6% dividend yield, the highest in the industry, also limits short-term downside risks. 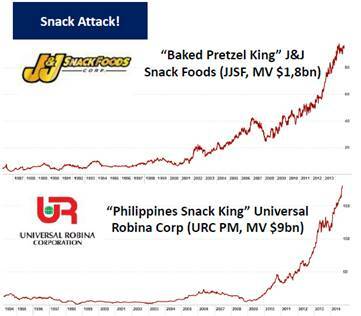 Its unique low-fat high-protein healthy snack and wide-moat distribution network makes the company either an attractive takeover target or long-term strategic partner to the giant snack producers from URC to Mondelez and General Mills, thus providing long-term downside protection in its terminal value. Organic food and healthy snack company Annie’s was acquired In Sep 2014 by General Mills for $820M at Price/Sales 4x (vs the company’s P/Sales 1.5x), following similar moves by General Mills, Kellogg, Campbell Soup, Hillshire Brands, Tyson Foods, JM Smucker, TreeHouse Goods, WhiteWave etc. The trend of forgoing meals in favor of healthy snacks is accelerating. It is the flagship vehicle of a family business group whose storied history has been long forgotten following unusual succession challenges in the third generation. Led by the capable son-in-law to the daughter of the third-generation scion, the Group is the ‘comeback kid’ who has successfully resurrected from the 1997/98 Asian Financial Crisis and has listed 4 of its 6 major business assets to derisk the business group governance risk and instill a strong sense of accountability and transparency for long-term going-concern viability. As the flagship vehicle, this Asian listed company will be the most important vehicle in the Group to equitize the governance goodwill and long-term strategic partnerships seeking to leverage its wide-moat distribution network and global export potential. We are impressed by the company’s efforts over the years to develop its human capital in caring about their knowledge by providing them training opportunities and multiple opportunities to engage in company activities to foster sharing and commitment. This is rare in Asian firms and the company deserves credit and a long-term valuation premium. The Moat Report Asia is a research service focused exclusively on competitively advantaged, attractively priced public companies in Asia. Together with our European partners BeyondProxy andThe Manual of Ideas, the idea-oriented acclaimed monthly research publication for institutional and private investors, we scour Asia to produce The Moat Report Asia, a monthly in-depth presentation report highlighting an undervalued wide-moat business in Asia with an innovative and resilient business model to compound value in uncertain times. Our Members from North America, the Nordic, Europe, the Oceania and Asia include professional value investors with over $20 billion in asset under management in equities, secretive global hedge fund giants, and savvy private individual investors who are lifelong learners in the art of value investing.